DURHAM, NC--(Marketwire - December 11, 2008) - Tecan's new MCA384™ Disposable Tips are specifically designed to optimize performance of the 384-MultiChannel Arm option for Freedom EVO® workstations, maximizing productivity for automated liquid handling applications in life science research with improved accuracy and reliability. The product range complements the unrivalled flexibility of the 384-MultiChannel Arm. The unique, integrated sealing system and precision fit of the MCA384 Disposable Tips improve precision, performance and reliability while reducing maintenance costs. Currently available in 50 µl and 125 µl sizes -- with 15 µl tips due for release early next year -- MCA384 Disposable Tips guarantee accurate pipetting across a broad volume range, from 0.5 µl to 125 µl. 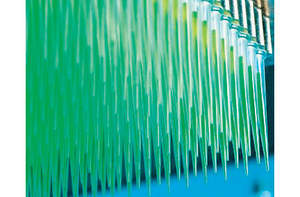 Tips are supplied in color-coded racks with labeling for quick and simple identification of tip volume and purity, and are offered in sterile or non-sterile options. MCA384 Disposable Tips also offer additional functionalities, such as the ability to work in 1,536-well format plates using 15 µl tips and full-depth access in deep-well plates with 125 µl tips. To find out more on Tecan's MCA384 Disposable Tips, visit www.tecan.com/consumables. Tecan (www.tecan.com) is a leading global supplier of laboratory instruments and solutions for the biopharma, forensic and diagnostic industries. The company specializes in the development, production and distribution of automation solutions for life science laboratories. Through its REMP subsidiary (www.remp.com), Tecan is the premier supplier of automated laboratory storage and logistics systems. Tecan's clients include pharmaceutical and biotech companies, university research departments, diagnostic laboratories and companies as well as forensics laboratories. Founded in Switzerland in 1980, the company has production, research and development sites in both North America and Europe and maintains a sales and service network in 52 countries. In 2007, Tecan achieved sales of CHF 414.4 million (USD 345.3 million; EUR 252.7 million). Registered shares of the Tecan Group are traded on the SWX Swiss Exchange (TK: TECN/Reuters: TECZn.S/Valor: 1210019).